This is Mary Dominski’s Celtic Braid hat, knitted in Blackberry Ridge bulky weight 25% mohair, 75% Wool. I knitted this quite some time ago, but the pattern and the kit are still available on the Blackberry Ridge site. The pattern is a great introduction to simple Fair Isle two-color knitting. The double strand braid is a fun component, clearly explained in the pattern. There is a matching easy mitten pattern that repeats the Fair Isle pattern in the cuff. I’ve knit that as well, and again the pattern is very straightforward. This is one seriously warm hat. 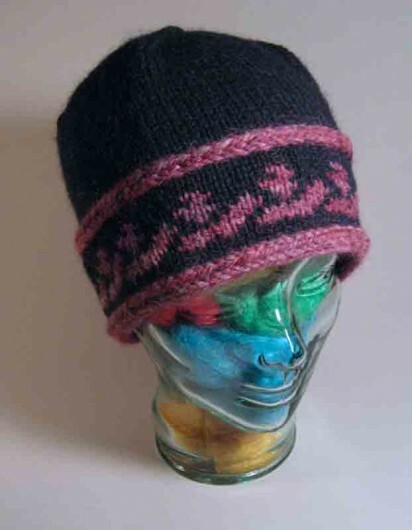 This entry was posted in Knitting and tagged Celtic Braid Hat, Mary Dominski by Noreen. Bookmark the permalink. i love that kind of doublebraid!! i have a hat pattern i’ve made a few times (here’s one, and every time i’m just enthralled by it. i love the delicate fair isle pattern of yours, really pretty. Very attractive hat. I bet it looks good on, too. The hat’s simplicity gets high marks and I love the contrast between black and pink.